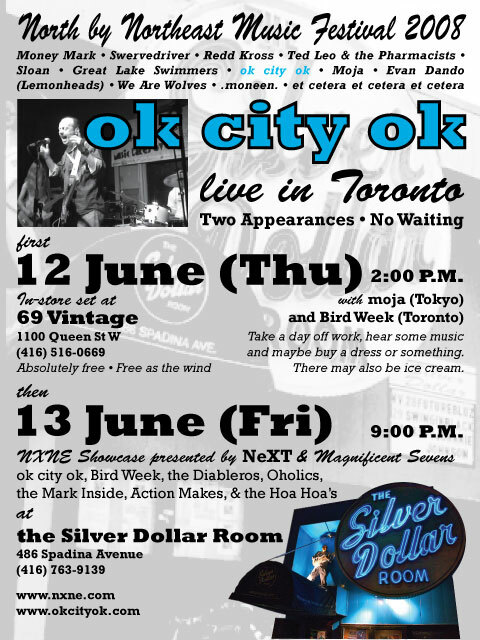 Greetings, friends of ok city ok.
We couldn't go to the Dewey Beach Popfest in the USA in April, and we couldn't go to the UK for the Liverpool Sound City Festival in May, but when we got re-invited to Toronto by the noble people of NXNE, we said by all means. Toronto's NOW Magazine sports a (perhaps that should be "the") photo of ok city ok in a recommendation of Friday's show. A confused craveonline.com summer festival preview recommends that you "come for: Money Mark, French Kicks, and Swervedriver . . . stay for: Ok City Ok, Menwhopause, and Grimskunk." iSound.com also mistakes us for an act that is often mentioned alongside Besnard Lakes and Ted Leo & the Pharmacists. That will do for now. Courage! Or, if you prefer the actual CD itself, it can be purchased through CD Baby for the same ridiculously low price of about 10 bucks. Want off this mailing list? Just drop us a line here.